Most of the whisky I review here is single malt; it’s usually fairly well aged and is very much a ‘premium product’. This week we have the exact opposite, in the form of Tesco Special Reserve Scotch Whisky, a 3 year old blended whisky of no clear origin. The question is, how good can a seven pound bottle of supermarket whisky be?! Well, it looks fairly good in the glass, having got some decent colour from it’s short stint in the cask. The nose is a little unappealing, full of raw grains and alcohol and not a great deal else – there is the tiniest hint of a toffee sweetness, but it’s almost undetectable. A splash of water robs it even of this hint. I’m pleasantly surprised on tasting, however. Although there is an initial burst of slightly harsh grain, it quickly fades leaving you with a light, gently sweet and smooth whisky. Watered, that harshness lingers longer and the gentle sweetness falls away – definitely one to be enjoyed neat, then. Ok, so this is a simplistic whisky that will never set the world on fire. It’s nose is pretty uninspiring, but as a drinking whisky you could do a lot worse. Just don’t sniff too deeply as you drink! I agree. As a ‘midweek’ whisky its ok. When drunk in isolation its not too bad but compared to other blends such as Grants or Monkey Shoulder its harsh. The nose is pretty nasty tbh, very medicinal and not too pleasant. The mouth feel and finish is ok but disappears rather quickly. 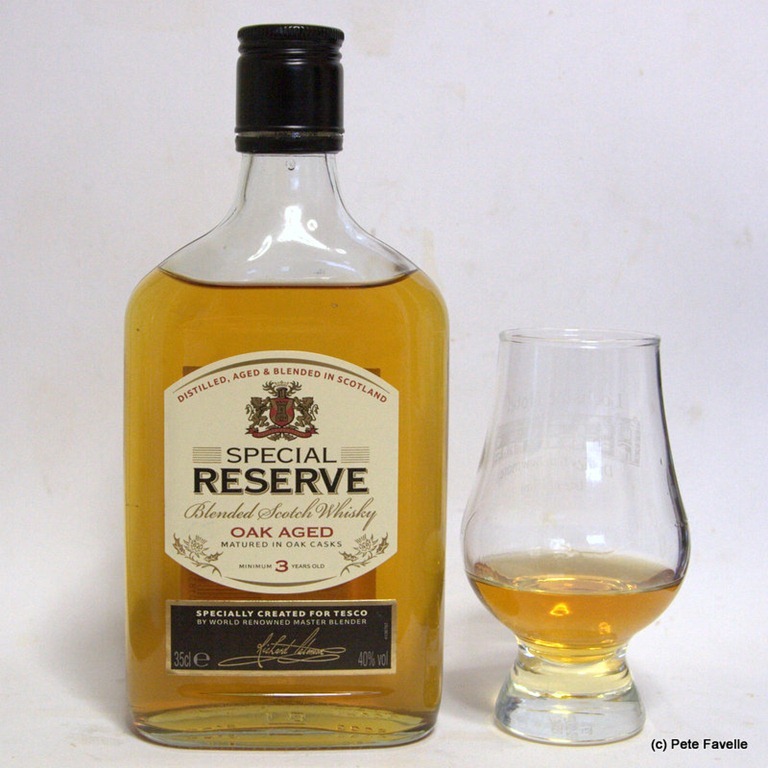 Well Tesco just substituted a Grants family reserve with this one as a home delivery. Its going back!!!! My god don’t replace a decent product wit MOONSHINE. I really missed the taste of the ordinary sider and whisky since. (Btw on the Island I’ve missed not pasterizated lager, ‘cos stouts and bitters are in Albion just prima). So, looking for something more “whiskisch” then our “vodkas”, I went to my local Tesco, and Kaboom! 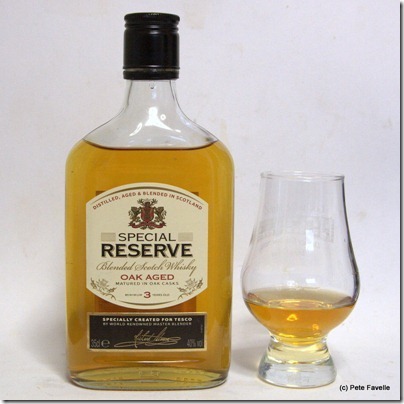 There is a “Special Reserve” on the shelf! I’m telling you, Friends of Orange Bottles: this (whatever is inside) blend is great, as for its price! 27,99 PLZ (appr. 3,4 GBP) for a 0,7 l bottle! I don’t drink very often but I think a drop of this in my coffee tastes very nice ??? ?